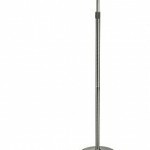 Posted September 23, 2016 by Norburn Lighting and Bath Centre & filed under Decorative Lighting Fixtures, LED, New Products, Portable Lamps, Portable Lamps, Trends . Bare branches, and graceful falling leaves are quintessential of Autumn, and gives a sense of tranquility. 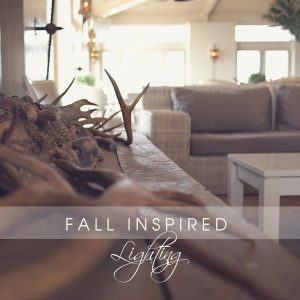 The Aldo (Eurofase), Tree Branch (Elk Lighting), and Aspen (Elk Lighting) represent nature during this transitional phase. 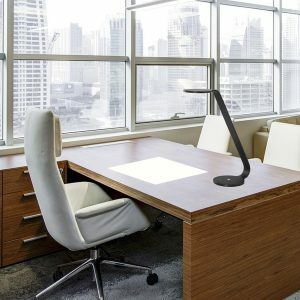 The Aldo highlights the beauty of barren branches as the sculpture suspends within an open LED frame. The Tree Branch lamp has a base resembling the roots of a tree, and the Aspen incorporates the raw texture of Aspen bark. Dusty cedar, hickory, tan, and other neutrals are often associated with Autumn, as well as warm metals such as copper, bronze, rust, and antique finishing. These warm tones can be seen in a variety of fixtures, such as the Rebar Studio (Artcraft), Jersey (Artcraft), and the Swing (Progress). The architectural use of rebar material, exposed pipes and exposed bulbs gives these fixtures an urban industrial appeal, and is further enhanced with dark metals and vintage undertones of brass and bronze. Thick fabrics, rich tones, and texture mark the beginning of “sweater weather” in Autumn. The Bali Chandelier (Maxim) and Kelp Mirror (Feiss) are reminiscent of “sweater weather” qualities. The white inner shade of the Bali chandelier provides a soft backdrop for the woven string pattern replicating the look of a ball of yarn, while the Kelp mirror offers a unique textured frame similar to kelp. The marriage of wood and metal symbolizes the Autumn activities that often take part outside the city limits. The wagon that carries the pumpkins from the pumpkin patch, or the barn that provides a dwelling space to escape the cold use a combination of wood and metal. The Collingwood (Artcraft), and the Fornes (Eglo) demonstrates two variations of the mixture of wood and metal. The Collingwood pendant is finished in walnut and dark metal hardware, exuding a rustic appeal, while the Fornes embraces modernity with the use of clean lines, and LED technology. The Fornes also has a wood finish with steel hardware. The Autumn season also signifies a time of reflection, which is represented by the Autumn (Hubbardton Forge), and the Wicker Mirror (Dimond Lighting). The Autumn pendant is a true reflection of the Autumn season, capturing the look of cascading leaves in it’s entirety. The Wicker Mirror offers a reflective surface, with a wicker designed frame that gives a nod to past decades. Though Autumn has a brief presence, you can find its qualities in a variety of fixtures and portables that will last beyond a season. 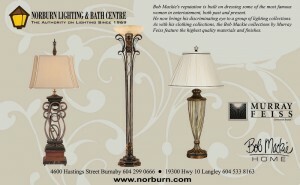 Check out our showroom for more selections and the latest design in lighting. 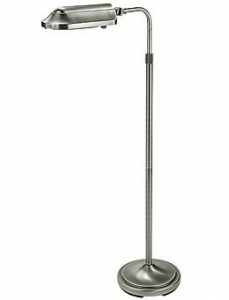 Posted September 1, 2016 by Norburn Lighting and Bath Centre & filed under Portable Lamps, Sales and Promotions . We are starting off our new theme with a sale! 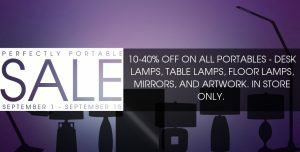 All regular price portables, such as desk lamps, table lamps, floor lamps, and mirrors will be 10 to 40% off from September 1, 2016 until September 15, 2016. 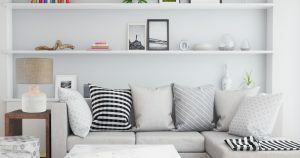 Whether you are looking for something to help you function during another school year, or simply looking for a decorative element to finish the look of your home, portables can satisfy your functional and decorative needs. Perfectly Portable allows you to be adventurous with trends and style decisions without having to permanently commit. Portables can help add visual interest, by adding a pop of colour, a different texture, or shape to a room. Portables are made to be convenient, and can transform a room into greater heights. Find a portable that speaks to you! 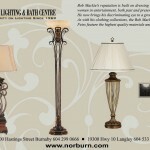 Posted August 8, 2016 by Norburn Lighting and Bath Centre & filed under Decorative Lighting Fixtures, New Products, Pendant Lighting, Portable Lamps, Portable Lamps, Trends . 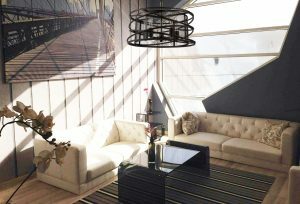 The industrial/loft style embraces raw, unfinished, and exposed elements that give an overall relaxed and casual feel. 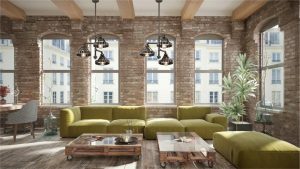 Exposed brick walls, beams, unfinished wood floors, and concrete are some of the characteristics associated with an industrial-loft. The Rockport lamp is made of polished concrete with a burlap shade. 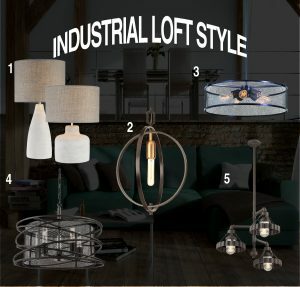 The neutral pallet of the lamp makes it a versatile piece, and is a subtle way to incorporate an industrial style to any space. 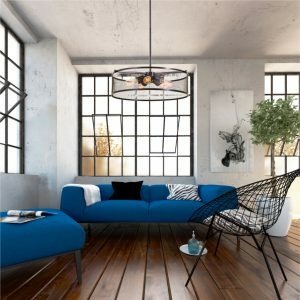 The Swing 1-Light pendant has an open-concept design that features a vintage Edison bulb at the center, and uses mix metal accents of vintage bronze. The exposed bulb design incorporates the “raw” characteristic of industrial style, and defies past faux pas with the use of mix metals. The Gastown 5-Light pendant has a meshed graphite shade with rich dark tones reminiscent of steel warehouse windows. The Rebar Studio chandelier is designed with reinforcing bars, commonly used in construction projects to support concrete. The reinforcing bars are wrapped around the outer shade, while the inner shade is made of a metal mesh. The Canary Wharf is the epitome of industrial style, having a deconstructed and weathered down appeal. The Canary Wharf is made of hand-crafted iron that mimics the look of exposed pipes and gears, and finished in Burnt Sienna. 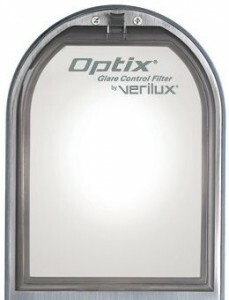 Posted September 8, 2015 by Norburn Lighting and Bath Centre & filed under LED, Portable Lamps, Trends . Guaranteed to help you see your homework better! 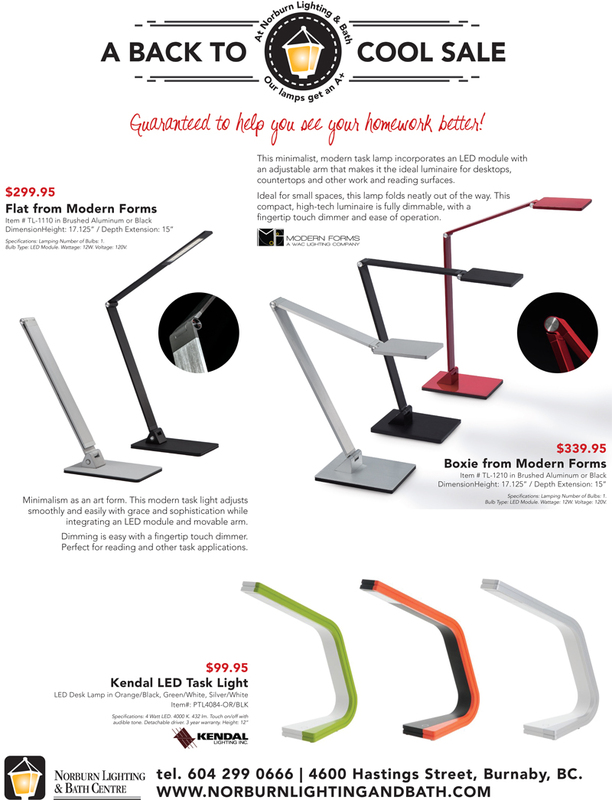 Brighten your work space, craft table or homework area with as LED desk lamp from Norburn Lighting. 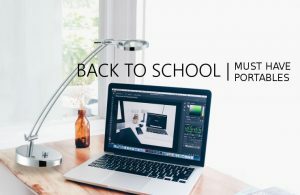 Whether you require a lamp for your home office or late at night for homework a contemporary LED desk lamp lets you see colors clearly while you read, write or work online. 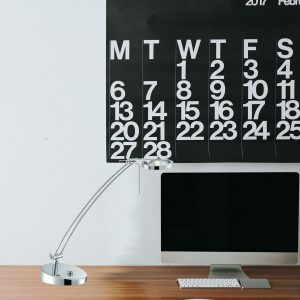 The right desk lamp can make work less tiring and more effective and will add to your decor, too. 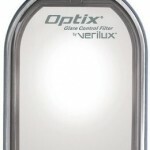 Posted June 20, 2010 by Norburn Lighting and Bath Centre & filed under Decorative Lighting Fixtures, Portable Lamps, Tips and Advice . 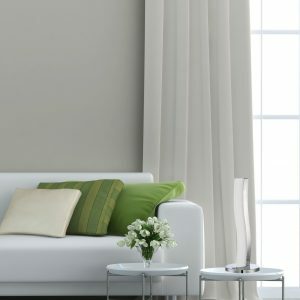 styles, finishes and shade colors to choose from. 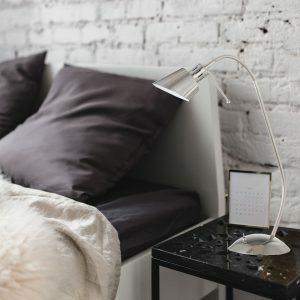 beautiful accent pieces and provide great task lighting in your bedroom. 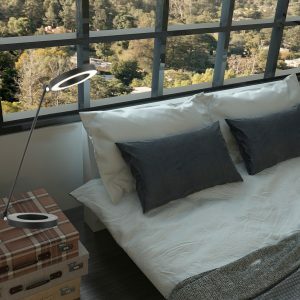 switch on your swing arm wall lamp on your side of the bed!